The Mozambican who inspired this recipe cooks it differently each time he makes it, depending on what is fresh in the market and what spices he can get. The squash most frequently available in Mozambique is similar to the giant in West Indian or Caribbean variety that can be found in parts of Canada and the U.S. Butternut is another good choice but any winter squash will do. It's the method that's important here. Peel, cube and boil the squash in enough water to cover. (If your squash is extremely hard, you may boil it whole or in large chuncks until it becomes soft enough to peel and chop.) When the pieces are very soft, lift them out, leaving water in the pot. Mash squash with a fork, or put through a sieve, and return to cooking water. Simmer gently, adding the bay leaf. Meanwhile, saute the crushed garlic and onion in oil or butter. Combine the remaining spices and add them to the butter mixture. Saute over low heat for 5-10 minutes until flavors have blended well. Then spoon a little of the squash liquid into the skillet with the spice/butter; stir and simmer gently until combined, and pour into the soup pot. Add water to make about 6 cups and stir in lemon juice to taste. Variations: Chicken stock may be used instead of water, and other vegetables may be added. 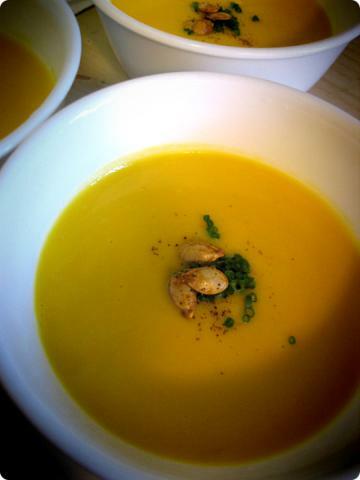 Among other spices that work well in squash soup are coriander, fennel, celery seed, rosemary and cayenne pepepr.